The Islamic State militants (formerly ISIS) have released a gruesome new video in which they warn of an attack similar to 9/11, promise to “burn America” and threaten US nationals around the world. In the 11 minute video, the militants claim that jihadi groups have grown stronger since the 9/11 terrorist attacks carried out by Al-Qaeda in New York and Washington DC, and allege that Islamists have “more resources”. Referring to terrorists as “the mujahedeen” – someone waging jihad - the voice in the video says that “they are able to burn the US again." The video includes footage of the infamous Paris and Ottawa shootings, during which the militants seem to hint that after France and Canada, there could be a similar attack in the US. The chilling video also shows atrocities which were previously committed by the IS militants including the beheading of US journalist James Foley and Steven Sotloff , the burning of Jordanian pilot Moaz al-Kasasbeh as well as other horrific mass beheadings. It also includes images of the militants in combat. 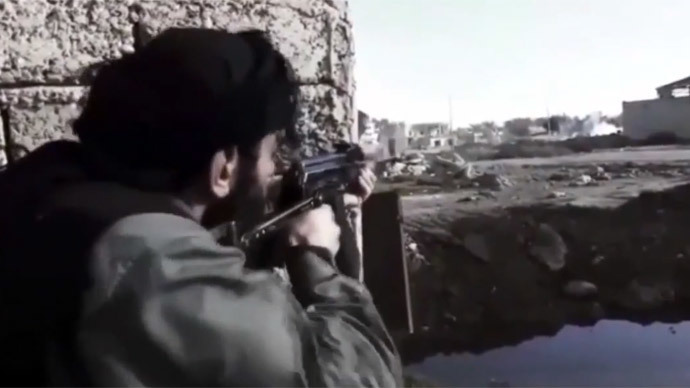 The latest video is not the first in which the militants threaten the US. In January, the IS released a similar video in which they expressed intentions to turn the US into a “Muslim province” and threatened to behead President Barack Obama. On Wednesday, the militants launched the social media campaign with the hashtag #WeWillBurnUSAgain calling for “lone wolf” attacks. According to the SITE blog on terrorism and extremism the hashtag exceeded 15,000 uses by Friday. “In a time of lone wolf attacks, and Americans and other Westerners pledging to the Islamic State, this kind of campaign should not be taken lightly,” said SITE Director Rita Katz. Among the latest IS-inspired plots was an attempt to detonate a bomb at the US Fort Riley army base in Kansas. A number of raids have been carried out by US law enforcement officials to prevent similar attacks in recent weeks.